Treats for Baby Tuesday: The Children’s Place, Babies R Us + More! Treats for Baby Tuesday is brought to you by Marybeth Hamilton, mom to two toddlers born 12 months apart, a wife, a number-cruncher and a bargain shopper! Marybeth blogs about baby, child and maternity deals 7 days a week at Baby Goodbuys. The Babies R Us sales flyer is available online. Visit the store through 4/12/12 and get savings on furniture, feeding items, clothing, shoes and more! Spend $20 or more at Build-a-Bear Workshop and get a FREE egg-decorating kit. Use this printable coupon for The Children’s Place to save 15% on your total purchase through 4/8/12. 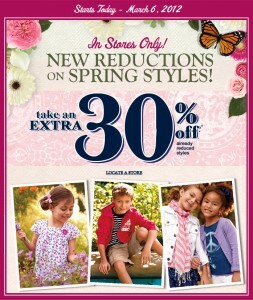 Shop online or in Gymboree stores and save 30% on your entire purchase! No coupon is necessary. This OshKosh B’Gosh printable coupon will save you 20%/$50 or more in stores. Start your gift registry online with BuyBuy Baby and get a FREE gift bag! Jumbo packs of Huggies Diapers, Training Pants and Overnights are are $8.50 ea. Select Playtex Baby Accessories (Pacifiers, Bottles, Cups, etc.) are $4 ea. Tubs of Gerber Good Start are on sale for $22 ea. Select Johnson’s Baby items and Desitin are $2.99 ea. Use one of these Johnson’s Baby printable coupons to save even more! Tubs of Huggies wipes are $3 ea. Tugaboos Diapers and Overnights and Training Pants are all B1G1 50% off. Buy 2 Tugaboos Training Pants or Overnights and submit for $3 cash back via Rite Aid’s Single Check Rebate. You can do the rebate twice to get up to $6 back! Jumbo pack of Pampers Diapers and Training Pants are $9.99 ea. B1G$2 in +UP Rewards. Select Tugaboos Infant Care items are 2/$5. Spend $10 and get $2 in +UP Rewards at checkout. Buy a $25 Toys R Us/Babies R Us gift card and receive $3 in +UP Rewards! Big packs of Huggies Diapers are $19.99. Jumbo packs of Huggies are on sale for $9.49. Select Enfamil, Similac and Gerber Good Start baby formula tubs are $22.99. Use this Enfamil printable coupon to save $5 on one tub of baby formula. Value packs of select Huggies and Pampers Diapers are $29.99. B2G$10 Target gift card at checkout. Select Gerber Graduates food are 10% off. Club packs of Up & Up Diapers are $19.99 ea. Club packs of Up & Up baby wipes are $13.69 ea. That’s 792 wipes for $13.69! Save $10 with any P&G purchase of $50 or more. Pampers, Tide, Dreft and plenty of other brands are included in this. Save $20 with any P& G purchase of $100 or more. Spend $50 on baby formula and get a free $5 BRU gift card! See the previous Treats for Baby Tuesdays for more offers that are still available! The newest Babies R Us flyer is available! You can see all the details for the sale here. Some promotions end on 3/13/12 and some run through 3/22/12. Use this Old Navy printable coupon to save 10% on your entire in-store purchase! Use this Build-a-Bear coupon to save $5/$25 or more. This Osh Kosh B’Gosh printable coupon will save you 20%/$40 or more. Don’t forget to get your FREE $10 gift card at Tanger Outlets! Use a Carter’s printable coupon to save 20%/$40 or more. Jumbo packs of Pampers are $8.50 ea. Tubs of Pampers wipes are $3 ea. All Avent baby accessories are B1G1 50% off. CVS Cotton Swabs are B1G1 50% off. All Gerber baby products are B1G1 50% off. 320-360 ct. packs of CVS Soft Cloths Baby Wipes are $8 ea. CVS baby care items are 2/$5. Select Advil items, including Children’s and Infant Advil are B1G1 50% off. Pediacare Children’s or Infant pain relief is on sale for $5.99. B1G$5 in ExtraCare Bucks. Use this $1/1 Pediacare Product printable to get a bottle of Pediacare for FREE! Big packs of Luvs Diapers are $16.99. B1G$3 in +UP Rewards. Jumbo packs of Tugaboos Diapers, Overnights or Trainings Pants are 2/$16. Buy 2 and submit your Rite Aid Single Check Rebate to receive $3 cash back. 360 ct. packs of Tugaboos Baby Wipes are $8.99. Receive $1 in +UP Rewards wyb 1 and submit a Rite Aid Single Check Rebate for $1 cash back! Pampers Baby Wipes are $3/tub. Select Johnson’s Baby Care items are $3 ea. Use one of these Johnson’s printable coupons to save even more! $1.50/1 Nuk Trendline Bottle, Learning Cup, or Pacifier coupons to save even more! Jumbo packs of Walgreens-brand Premium Diapers, Overnights and Training Pants are $5.99 ea. Soft packs of Walgreens Baby Wipes are $1.99 ea. Super Packs (72-112 ct.) of Pampers Cruisers are $24.99. Refill packs of Pampers Wipes are $5.99. Big packs of Huggies and Pampers Diapers and Training Pants are $19 ea. Big packs of Luvs Diapers are on sale for $16 ea. Select Similac Formula tubs are $22. Other Select Similac Baby Formulas are an extra 10% off. Save $5 on all Huggies Diapers (11 ct. or higher) or BRU value boxes of Diapers with in-ad coupon. Ads should be available in all stores. Get a FREE $10 BRU gift card wyb 3 select Similac, Enfamil or Gerber Good Start Ready-to-Feed Baby Formula. Save $10 on the Huggies Little Movers and Slip & Diapers Winnie the Pooh tote. Treats for Baby Tuesday: Little Tikes, Motherhood Maternity + More! Sign up for the Little Tikes Birthday Club and you’ll receive special offers for your child’s birthday! Use this Gymboree coupon to take your little one to a FREE Gymboree Play & Music class. This Carter’s printable coupon will save you $10/$50 or more in-store purchases. Moms-to-Be can get a FREE gift bag from Motherhood Maternity when you make your first in-store purchase! New this morning! Save up to 70% on clearance items at Gymboree.com! Shipping is a flat $5. Jumbo packs of CVS brand Diapers and Training Pants are $6.99. B1G$2 in ExtraCare Bucks at checkout! There are two baby items included in the multi-product B3G1 FREE sale: Refill packs of Pampers Sensitive Wipes and Super packs of Pampers Diapers. Select Johnson’s Baby and Desitin items are on sale for $5.49. Use one or more of these Johnson’s Baby printable coupons to save even more! Select Pedialyte items are $4.99 this week. Spend $30 on select Procter & Gamble items, including Pampers, and get $10 in +UP Rewards at checkout. You’ll also get another $5 in +UP rewards if you spend $25 on Pampers through 3/6. That means you’ll get $15 back in rewards if you spend at least $30 on these and other P&G products! Use the Pampers Diapers printable coupons to save $1.50 per jumbo pack of diapers and get a great diaper deal! Jumbo packs of Pampers Diapers are 2/$20. B2G$2 in Register Rewards. Select Johnson’s Baby Care and Desitin products are 2/$6. B2G$2 in Register Rewards at checkout. Use one or more of these Johnson’s Baby coupons to save even more! Select Playtex baby bottles, cups, pacifiers and other items are B1G1 50% off. All Huggies and Pampers jumbo packs are $9 ea. this week. Refill packs of Pampers Wipes are $10.99. Big packs of Pampers Diapers and Training Pants are $19.99 ea. Get a coupon for $10 off your next purchase wyb these and other select Procter & Gamble items. 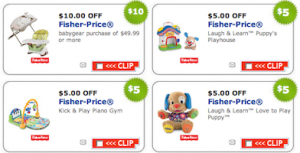 Treats for Baby Tuesday: Fisher-Price, Carters + More! Get up to $80 in Fisher-Price printables for baby gear and toys! Like Build-a-Bear workshop on Facebook and get a coupon to save $10/$30 or more. Save 15% in stores with this The Children’s Place printable coupon! Use this Carter’s printable coupon to save 20%/$40 or more in purchases. Jumbo packs of Luvs diapers are $6.99 ea. Jumbo packs of Huggies Diapers, Trainers and Overnights are $9.49 ea. Value packs of CVS Soft Cloths Baby Wipes are $4.99 ea. Value packs of Huggies Baby Wipes are $5.99 ea. Super packs of Pampers Diapers are $27.99. Jumbo packs of Tugaboos Diapers, Overnights and Training Pants are B1G1 50% off. All Aveeno baby care items are B1G1 50% off. Tubs of Huggies Wipes are $2.49 ea. Baby Magic Dustless Baby Powder is on sale for $6. Submit the Walgreens mail in rebate and receive $6 back via mail. Final price = FREE! Jumbo packs of Huggies Diapers, Pull-Ups and GoodNites are $9.49. B1G$2 in Register Rewards at checkout. Select Value packs of Huggies Diapers are $29.99. B2G$10 Target gift card at checkout. Save 10% on all HappyBaby, Earth’s Best, Plum Organics and Ella’s Kitchen Baby Food. Select Value packs of Pampers Diapers are $29.99. B2G$45 Target gift card at checkout. Special-size boxes of Huggies Diapers are on Rollback for $22.94 ea. Treats for Baby Tuesday: Desitin, Old Navy + More! Sign up for the Beech-Nut email list and get new printable coupons emailed to you monthly! Save 40% on one book this weekend with this Half Price Books printable coupon. Get three $1 off Desitin printable coupons! Use this Old Navy printable coupon to save $15/$75 or more. Select Pedialyte products are $4.99. B1G$1 in ECBs at checkout. CVS Diapers, Wipes, Baby Formula and other baby care items are B1G1 50% off. Big packs of Huggies Diapers are $19.99 ea., big packs of Huggies Wipes are $5.99 ea. Spend $30 on these and other select items and get a FREE $10 CVSCash Card. See ad for details. Big packs of Luvs Diapers are $16.99. B1G$2 in +UP rewards at checkout. Jumbo packs of Huggies are $9.99. B1G$1 in +UP rewards at checkout. Jumbo packs of Tugaboos Diapers and Training Pants are 2/$17. Huggies Wipes are B1G1 50% off. Buy two select Rite Aid-brand Baby Care items (priced at 2/$5) and receive $1 in +UP rewards. Jumbo packs of Huggies Diapers, Overnights and Training Pants are $8.99 ea. 40-oz. cans of Up & Up Powder Baby Formula are $17.99. All other Up & Up Baby Formulas are 10% off. Select 23-oz. tubs of Similac Baby Formula are $22.99. Save 10% on other select powder Similac Formulas.